Daniel Lusk is author of six collections of poetry. His most recent books are The Shower Scene from Hamlet (Maple Tree Editions, 2017 an imprint of Phoenix Books) and The Vermeer Suite (Wind Ridge, 2015), which features poems based on the masterpieces of 17th Century Dutch painter Johannes Vermeer with full-color images of the works that inspired them. Other poetry collections include KIN (Wind Ridge, 2013); Lake Studies: Meditations on Lake Champlain (Lake Champlain Maritime Museum, 2011); a companion audiobook on CD, The Inland Sea: Reflections (LCMM, 2012); and Kissing the Ground: New & Selected Poems (Onion River, 1999). Daniel’s published work also includes a memoir, Girls I Never Married; an experimental novel, O, Rosie; Homemade Poems: A Handbook for teaching poetry to children; an anthology, Onion River: Six Vermont Poets, and three early chapbooks. His work appears in dozens of literary journals and anthologies, among them New Letters, Poetry, Prairie Schooner, Poetry Ireland Review, The Southern Review, The Beloit Poetry Journal, The Chariton Review, American Poetry Review, The North American Review, The Café Review, and 180 More: Extraordinary Poems for Every Day (Billy Collins, Editor.). Winner of a 2016 Pushcart Prize, Daniel also received the Gertrude B. Claytor Memorial Award of the Poetry Society of America for a poem on the American scene, a Pablo Neruda Poetry Award from Nimrod International Journal, and other awards. He has been awarded grants and literary fellowships from the Vermont Arts Council, Vermont Arts Endowment, the University of Vermont, and Pennsylvania Council on the Arts. He has been a Resident Fellow at Yaddo and The MacDowell Colony, Visiting Poet at Stranmillis University College-Queens in Belfast, N.I., and The Frost Place, Franconia. N.H., and Visiting Writer at Juniata College, Huntingdon, PA. He has presented readings of his work at the Folger Shakespeare Library, Smithsonian Institution, and Renwick Gallery (Washington, D.C.), and many other venues, among them state universities of Missouri, Wisconsin, Oklahoma, Wyoming, Montana, Delaware, South Dakota and Vermont. 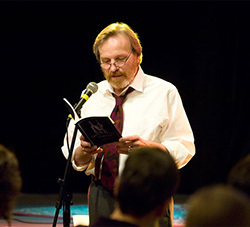 Following brief careers as a sports writer, jazz singer, and ranch hand, Daniel joined the National Endowment for the Arts Poets-in-the-schools Program, teaching workshops for children and teachers in more than 150 schools in South Dakota, Wyoming, Montana, New York, New Jersey, Delaware, and Pennsylvania. From 1978-83 his weekly radio commentaries on books (“Off the Wall”) were syndicated to 160 NPR affiliate stations nationwide. Now a Senior Lecturer of English Emeritus at the University of Vermont, Daniel is available for poetry readings, workshops, and master classes for teachers. Stranmillis University College, Belfast, N.I. Folger Shakespeare Library, Washington, D.C.
Renwick Gallery, The Smithsonian Institution, Washington, D.C.
schools and colleges in Vermont and elsewhere.